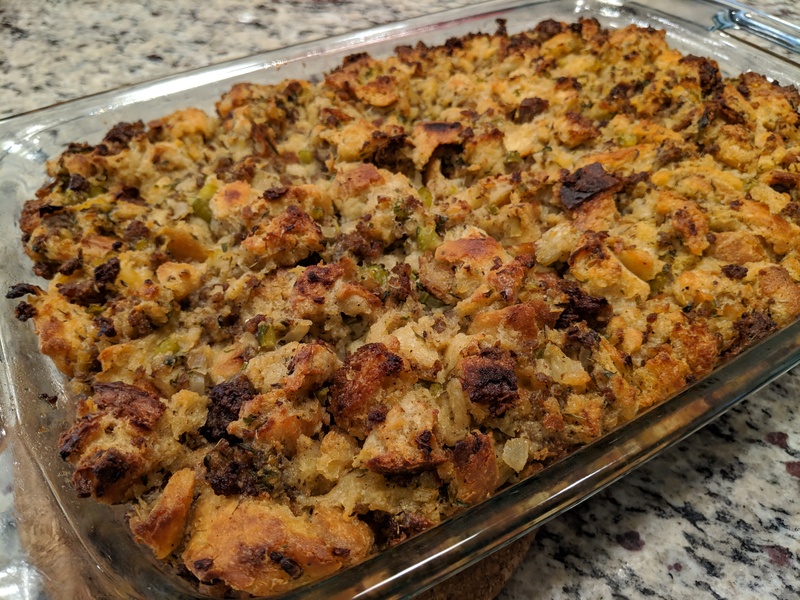 I was asked to bring stuffing for our Thanksgiving pitch-in, which to me means make something simple complicated (homemade). This was a huge hit and miles above the boxed equivalent. Preheat oven to 300° with racks in the middle. Butter a 3-qt. baking dish. Divide bread between 2 baking sheets and bake until dried out, 25–35 minutes. Let cool. Heat oil in a large skillet over medium-high. Cook sausage, breaking into small pieces, and until a little crispy. Transfer sausage to a plate. Reduce heat to medium and melt butter in same skillet. Add onion, fennel, and celery; season lightly with salt and pepper. Cook until vegetables are very tender but not browned, 12–15 minutes. Add wine to deglaze. Bring to a boil and cook until liquid is mostly evaporated, about 3 minutes. Toss in parsley, sage, and thyme and let mixture cool in skillet. Whisk eggs and 2 cups stock in a very large bowl. Add bread, sausage, and onion mixture and toss well to combine. Add salt and pepper. Drizzle remaining 2 cups stock over and toss again to combine. Let sit, tossing occasionally, until bread absorbs all of the liquid, about 10 minutes. Transfer stuffing to prepared dish; butter a sheet of foil and cover dish, butter side down. Bake on middle rack until very hot throughout (center should register 160°), 35–40 minutes. Remove foil and transfer baking dish to top rack. Continue to bake stuffing until golden brown, 25–30 minutes longer.